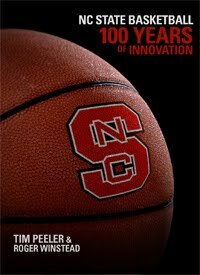 CHASS alums Tim Peeler (English ’87) and Roger Winstead (Communication ’87) vividly illustrate the many traditions and innovations that have shaped Wolfpack basketball as well as the history and customs of college basketball itself in their new book NC State Basketball: 100 Years of Innovation. Winstead came to NC State with the dream and determination of becoming a photographer. “In high school I was a radio disc jockey, but I knew I wanted to transition to photography,” Winstead said. “I majored in Communication because that would allow me to work with any type of media.” Winstead also found the Technician and the Agromeck to be useful avenues to develop his portfolio and friendships. After graduation, Winstead also sought employment in the newspaper industry. He worked for 10 years at the News & Observer capturing Final Four tournaments and presidential inaugurations. Winstead came back to NC State in 1998 as Director of Photography. NC State Basketball includes historical context and photographs that demonstrate the many college basketball traditions made famous at NC State, including cutting down the nets, spotlighting players during introductions and even the alley oop. Peeler and Winstead also recount renowned Wolfpack players and coaches who have passed through the doors of Thompson Gymnasium, Reynolds Coliseum and the RBC Center in the book, from Ronnie Shavlik and David Thompson to Sidney Lowe and Julius Hodge. Peeler and Winstead will discuss their new book and have a book signing on Thursday, November 4, at 7 pm in the Assembly Room, East Wing, D.H. Hill Library and on Saturday, November 13, at Carter Finely Stadium.